Energy regulator, Ofgem, have announced an increase to the energy price cap which will see energy bills rise for around 15 million UK households. The price cap for customers on default tariffs will be rising by £117 to £1,254 a year, while the cap for those on pre-payment meters is set to rise by £106 to £1,242. Customers can expect to see an increase in their bills from April 2019. Ofgem, who are responsible for setting the maximum price energy suppliers are able to charge customers for gas and electricity, have announced the cap increase to cover wholesale costs. Why is the Energy Price Cap Rising? The energy price cap is set to rise to cover the wholesale costs that energy suppliers are facing due to the higher price of oil. 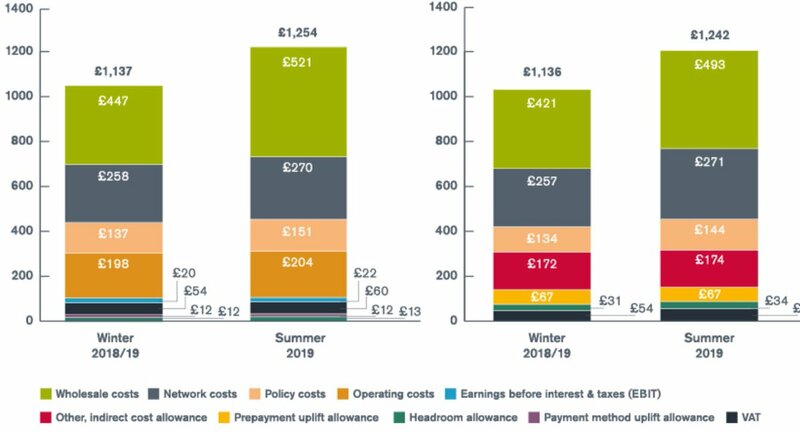 Around a third of a typical energy bill is made up of these wholesale costs. Further reasons for the increase include the costs of transporting fuel such as electricity and gas to homes as well as policy costs associated with environmental schemes. Below, you can see everything that makes up your energy bill and how April’s increase compares to the previous energy cap. The energy price cap is a government initiative, introduced to protect vulnerable customers and those who have been loyal to their energy supplier from paying too much. Energy suppliers are unable to charge their customers anymore than the energy price cap, helping to make prices fairer for customers. According to the Energy Saving Trust, you could save up to £250 a year by switching energy supplier and now is the perfect time to switch. If you’re not sure where to start when it comes to switching energy supplier, our Guide to Switching Energy Supplier 2019 can help you on the road to reduced energy bills. PREVIOUS POST What is the Cold Weather Payment? NEXT POST Do You Need a Plumber or a Heating Engineer?